February conjures up ideas of love as Valentine’s Day approaches and hearts and roses are scattered all around. Often, this focuses on love between couples; however, there are many other ways to recognize this beautiful emotion. Love for a child, a parent, pets, or friends are each important aspects of a well-fulfilled life. This love creates feel-good hormones, or endorphins, in all of us and makes our world a happier place. Loving yourself first is essential to love another unconditionally. How do you nurture yourself so you can wholeheartedly be there for the loves in your life? There are numerous ways to nurture your physical, beating, blood-pumping heart. We eat healthy foods such as vegetables, fruits, fish, nuts and seeds. We exercise, increasing our blood flow and oxygen levels. There are also different ways to nurture your heart on an emotional level. This can be more challenging at times, but it’s just as important. It is said that a broken heart brings about many physical ailments. To mend a broken heart, the focus must be turned to emotional healing modalities. There are many options for you to keep your heart chakra happy and healthy, including massage therapy, yoga, meditation and Reiki. Begin nurturing yourself and opening your heart space by scheduling a massage therapy session. Massage is an excellent way to promote self-awareness, which allows for the release of tension and guarding patterns. The benefits of massage are accumulative. Developing a consistent massage program creates space to let go of day-to-day stresses and chronic, built-up tension. Commit to a yoga class. Yoga continues to grow in our Western culture as it provides an opportunity for the physical body to release tension and stress so our mental and spiritual selves can begin to dissolve emotional blocks. As we move through physical postures we open the energy centers of the body, known as chakras. The common phrase, “open your heart center” used by yoga teachers is meant to have you focus your attention on your entire heart area or your heart chakra. This is the entire area between the rib cage and bottom of the throat and encompasses the front and back body. Opening the heart center creates the space for loving thoughts and feelings to be felt within ourselves and within our relationships. Empower yourself by taking a Reiki attunement class. Reiki practitioners serve as conduits for healing Reiki energy. This energy flows into the areas in your body, mind and spirit where it is needed. 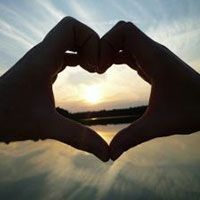 Learning self-healing techniques in Reiki I is a powerful tool to help release old wounds that may be in the way of experiencing a life you yearn for: one full of love and joy. Develop a meditation practice. Meditation improves self-awareness, increases self-confidence and builds self-trust. “Restore your attention or bring it to a new level by dramatically slowing down whatever you’re doing,” says Sharon Salzberg, author of “Real Happiness: The Power of Meditation.” Allowing time to reflect and be present in the moment increases focus and clarity into areas that are sometimes lost in the shuffle of a busy life.